Earlier this year, the Watson-Marlow Fluid Technology Group (WMFTG) unveiled its Quantum peristaltic pump with a ReNu single-use technology cartridge. The product is intended for downstream processing. GEN recently interviewed Tony Barrass, product manager, about the company’s new offering. GEN: The company notes that the Quantum provides a revolutionary single-use approach to downstream bioprocessing. How does it do so? Mr. Barrass: Quantum redefines pump performance in several ways. First of all, it has a 4-phase peristaltic pump technology that delivers low pulsation and ultra-low shear performance. The product is the lowest-shear product available that also has linear flow control. It offers a single-use fluid path with a comprehensive set of validation data. Quantum also is a flexible product with a wide flow range (5.33 mL/min up to 20 L/min). Flow is independent of outlet pressure. In addition, Quantum has a down ratio (4000:1), which provides excellent control resolution. Watson-Marlow has developed the Quantum peristaltic pump, which incorporates ReNu single-use technology. By installing different ReNu cartridges, users may switch fluid paths quickly while avoiding alignment errors. 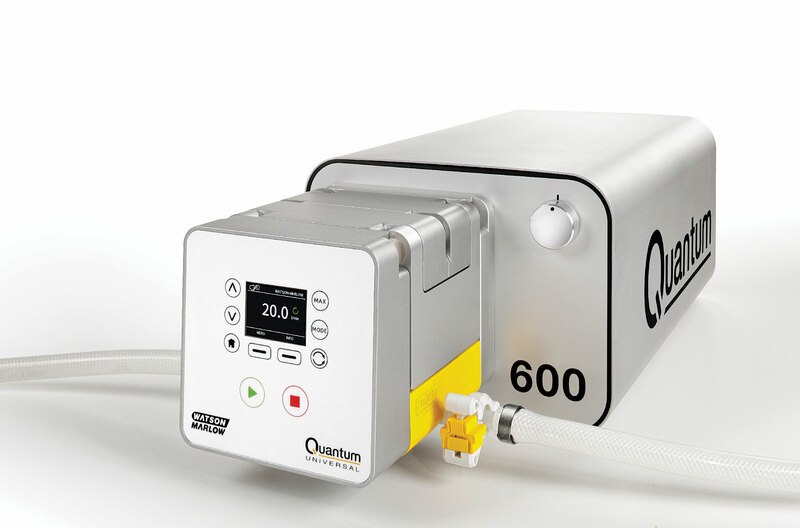 Quantum’s combination of peristaltic and single-use capabilities may be particularly useful in tangential-flow filtration, virus filtration, and high-performance liquid chromatography. GEN: How specifically does the Quantum differ from other pumps on the market? Mr. Barrass: Other options, like quaternary diaphragm pumps, have greater pulsation and complex flow paths, where sensitive fluids are forced through narrow apertures at high frequency. This creates high shear forces and cell damage, which can be avoided by using the ReNu SU technology cartridge with its simple flow path. Quantum also has advantages over centrifugal pumps, which have poor flow control, limited flow range, and a nonlinear response. GEN: What are the major benefits of the Quantum? Mr. Barrass: Closed-loop speed control and the linear flow characteristic, coupled with virtually pulse-free flow, means that maintaining transmembrane pressure in filtration applications is greatly improved over competitive technologies. Quantum is also excellent in other applications that require gentle transfer and a wide flow range. This includes chromatography systems, where Quantum provides a low-speed priming capability. GEN: What is the importance of the ReNu SU technology cartridge to the performance of the Quantum? Mr. Barrass: The ReNu SU technology cartridge is key to delivering the pump’s flow stability and process control. The materials used in the cartridge also ensure a product that is sterilizable through gamma irradiation, with stable reliability and high pressure performance at levels up to 50 kGy. ReNu SU technology cartridges are also supplied with a validation guide. This allows customers to considerably reduce the cost and time it takes for pump validation prior to being specified into single-use systems. The guide includes a comprehensive set of biocompatibility data with material tests, such as USP88, Class VI (in vivo) and USP87 (in vitro). Detailed extractable testing with a range of solvents in line with BioPhorum Operations Group (BPOG) and Bio-Process Systems Alliance (BPSA) guidelines has also been undertaken. The validation guide supports customers with their validation process, reducing overall time to market.